Today the U.S. Environmental Protection Agency (EPA) proposed the first-ever nationwide emission standards to limit dangerous carbon pollution from new coal- and gas-burning power plants. Today we take the first critically important step towards addressing the climate-destabilizing pollution emitted by power plants. Today we take a vital step towards protecting Americans’ health and strengthening our economy. With these standards and EPA’s landmark clean car standards, we’re beginning to address the clear and present danger of carbon pollution from the two largest emission sources in our nation. Power plants are responsible for 40 percent of the carbon pollution emitted in America. 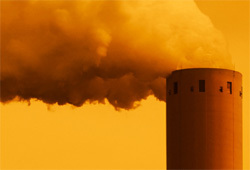 U.S. power plants are one of the largest sources of carbon pollution in the world. Power plants are responsible for 40% of carbon pollution emitted in the U.S.
We have the technology and the know-how to change this. The carbon pollution emission standards proposed by EPA today would halve the carbon emissions from a new coal-fired power plant over its lifetime. These standards will help further the progress we are making towards a cleaner, more secure future for energy in America. We will use our nation’s electricity resources more efficiently to cut energy costs for families and businesses, mobilize Made in the USA technologies and fuels for cleaner energy generation, and ensure that America will lead the global race to a clean energy economy. 29 states have adopted policies to expand reliance on cost-effective clean energy resources. States including Washington, Montana, Oregon, Minnesota, New York and California have adopted (or are now putting in place) limits on dangerous carbon pollution from fossil-fueled power plants. A McKinsey & Company report found that we could meet our nation’s growing electricity needs by using existing resources more wisely — and could cut energy costs for American families and businesses at the same time. Innovative businesses like Solar City are creating new solutions and technologies to deliver cleaner, safer energy. Solar City, founded in 2006, is installing solar systems that lower utility bills with no upfront investment by the customer. Solar City has 20,000 projects in 14 states that are either completed or underway– including a one billion dollar project to put solar systems on military housing. Hundreds of U.S. companies are capitalizing on new, multibillion-dollar market opportunities to make our electric grid as smart, flexible, and innovative as the internet — enabling a wholesale shirt to clean, community-based energy resources. There are also fundamental shifts in the energy market that are driving a change in our electricity supply. Much has been written about the structural market shift to natural gas, which has been enabled by new drilling technologies. Some have tried to deny this market shift and claim that EPA’s clean air protections are stopping new coal plants, but the truth is that basic economics — low natural gas prices— are driving these decisions. But don’t take our word for it. Check out these quotes. The new climate rule is in line with market forces anyway. We’re not going to build any coal plants in any event. You’re going to choose to build gas plants every time, regardless of what the rule is. Four years ago…we were about 70% of our energy from coal and about, I don’t know, 16% from nuclear, about 12% from gas and the balance from hydro. In the fourth quarter — this was really surprising to me, maybe not surprising considering how cheap gas is now – our energy production was 40% coal, 39% gas. … Now moving forward, given where gas prices are, we will continue to see much more gas production. Inexpensive natural gas is the biggest threat to coal. Nothing else even comes close. The immense natural gas resources recently made commercially accessible in the United States must be developed responsibly if we are to protect our water and ecosystems, and prevent wasteful leakage that will undermine the carbon pollution advantages of natural gas. But America can meet this urgent challenge. We also know how to harness the power of the wind, the sun, and geothermal resources. By making the energy foundation of our economy cleaner and more diverse, we will improve our national security, improve public health, and protect our climate. Today we took a big step down that road. Climate impacts are already affecting American communities, and scientists tell us that the impacts will intensify as atmospheric concentrations of heat-trapping greenhouse gas emissions rise. I mentioned earlier that American states, communities and businesses are already taking steps to address these threats. Starting today, they don’t have to do it alone. With today’s announcement, our entire country will fight the widespread and varied threats we face from climate change. I think EPA deserves a standing ovation for that. Please join me in supporting EPA’s efforts to protect our families, our communities, and our economy from these threats. The resistance to these standards by entrenched fossil fuel-dependent industries will likely be fierce, but together our voices can move these vitally important policies forward. This entry was posted in Clean Air Act, Economics, Energy, Greenhouse Gas Emissions, Health, News, Policy. Bookmark the permalink. Both comments and trackbacks are currently closed. What you write is incredible. It has no credibility at all. This regulation only effects NEW power plants. Since natural gas fueled power plants have no problem meeting the requirement, it will have no effect on natural gas plants. Since there is no way that a coal fired power plant can meet this regulation — not even IGCC (clean coal), the effect will be that no new coal fired power plants will be built. This might be a good thing except for the fact that it will create another perverse incentive to continue to use the old and inefficient coal fired power plants which were grandfathered under the CAA and which have no pollution control equipment at all.